When I think of red lipstick, classic and empowering are two words that come to mind. I can't explain it but when I sport a red lip, I feel like I can take on anything that comes my way. I am always amazed at how a simple lip color can build up an extra confidence boost in me. 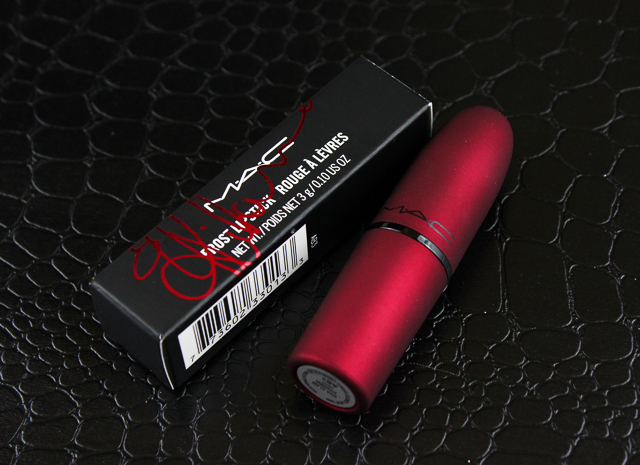 MAC's Viva Glam Rihanna lipstick is my latest red lip color acquisition, and it is just beautiful all around. 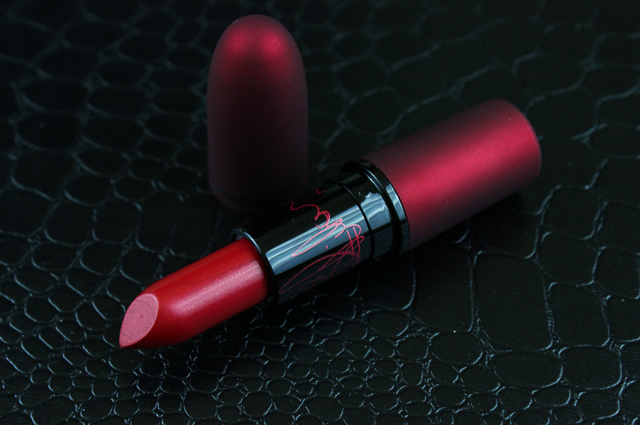 I love the luxurious red tube which features Rihanna's signature, and the fact that every cent of the sale price of this lipstick will go towards helping women, men, and children living with HIV / AIDS makes this product so very special. It's always admirable when companies do their part to help others, and bring awareness to important issues. 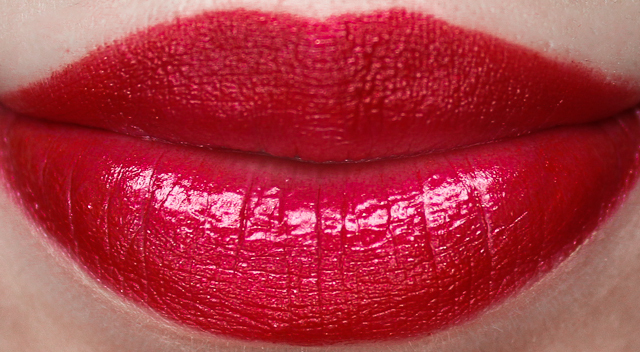 Viva Glam Rihanna is your timeless blue-red, with a little something extra. It contains a shiny frost finish (don't worry, it's not the outdated kind) that looks fresh, and modern. This is frost done right, ladies and gentlemen. 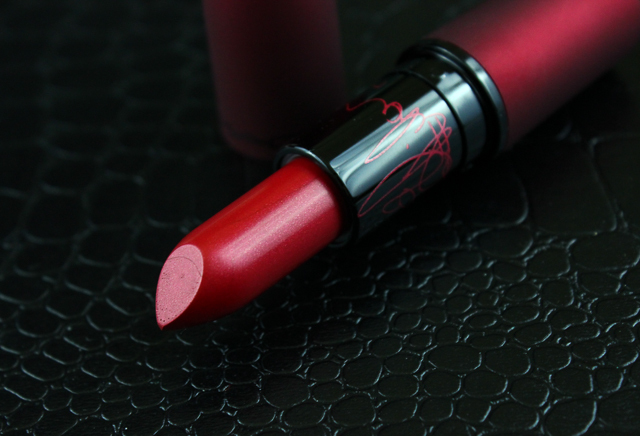 This lip color is nicely pigmented, and it has a creamy and smooth texture that effortlessly glides onto the lips. It feels super lightweight on, too. When it comes to longevity, I find that because of the lipstick's slick consistency, the color begins to show signs of fading pretty quickly-around the 2 to 3 hour mark. But, it's nothing a little re-application can't mend. Viva Glam Rihanna is a lovely new addition to MAC's Viva Glam product lineup. It's a stunning lip color that will look flattering on everyone, and it's definitely worth checking out. My red lipstick collection is pretty extensive, but to me, Viva Glam Rihanna is a unique enough red to have, since it contains that pretty frost finish. And I have to admit, this frosty red is a nice change from the usual matte reds that we often see. I might get the Viva Glam Rihanna Tinted Lipglass, next. I bet it's going to look gorgeous layered over the Viva Glam Rihanna lipstick! What do you all think of MAC's Viva Glam Rihanna lipstick?